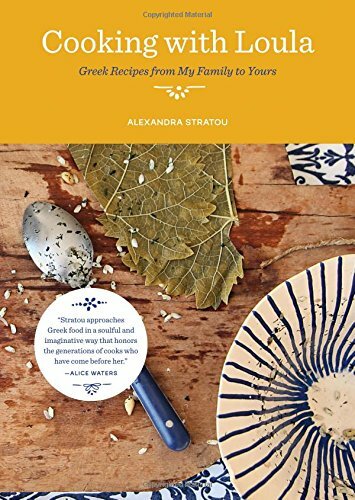 In Cooking with Loula, Alexandra Stratou invites readers into her Greek family�s kitchen, revealing their annual traditions and bringing their recipes to life�with touching remembrances of Kyria Loula (Kyria means �Mrs.� in Greek), the woman who cooked for three generations of Stratou�s family and who taught her that the secret ingredient in any beloved dish is the spirit the cook brings with her to the kitchen. Many classic dishes are represented here, such as pastitsio and dolmades, as well as inventive, unconventional creations such as a green salad with avocado, apple, and Dijon mustard and a spinach gnocchi in which feta cheese appears alongside Gorgonzola. The nearly 100 recipes are all hearty and unfussy, and organized the way real home cooks think, with chapters for simple, healthful weekday dishes; more languorous Sunday meals; and traditional holiday fare. With hundreds of mouthwatering photographs and whimsical illustrations, this book is truly a gem.